JACKSONVILLE, Fla. (AP) — Dan Mullen remembered the outcomes, but he couldn’t quite recall the details. 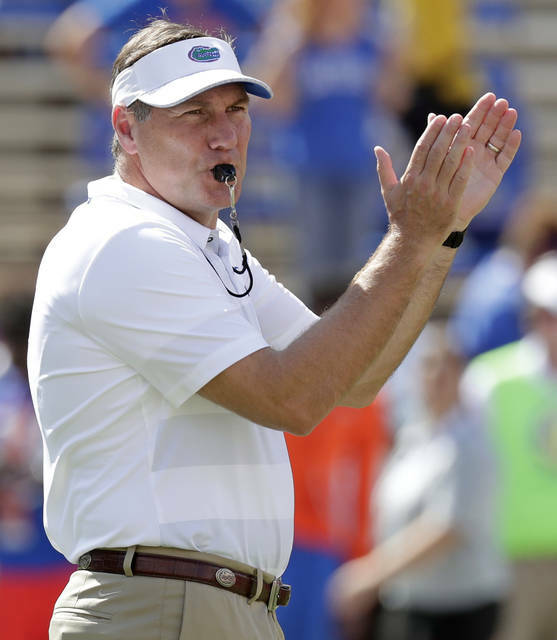 Mullen went 3-1 against the Bulldogs as Florida’s offensive coordinator, including two wins that helped propel the team to Southeastern Conference and national championships. The last one was his most memorable, a 49-10 victory that was essentially over early enough for Mullen to spend the final few minutes on the sideline instead of the coaches’ booth. Mullen begins a new chapter in the “World’s Largest Outdoor Cocktail Party” when No. 9 Florida (6-1, 4-1 SEC) and seventh-ranked Georgia (6-1, 4-1) meet in Jacksonville for the 83rd time in the last 86 years Saturday. For Mullen, who returned to Gainesville after nearly a decade at Mississippi State, the rivalry hasn’t changed a bit. It has ultra-high stakes and title-game aspirations. Florida and Georgia enter the neutral-site game ranked inside the top 10 for the first time since 2008, and the winner likely will wind up close to the fourth spot in the first edition of the College Football Playoff rankings next week. The loser probably can forget about playing for a national championship or getting to Atlanta for the SEC title game. “If you’re not amped up this game or you’re not excited, you’re screwed up in the head,” Florida guard Tyler Jordan said. ESPN’s College GameDay as well as SEC Nation will broadcast live a few hundred yards apart, the first time they’ve been at the same venue on the same day during the regular season. It’s also the first game in a two-week span that will showcase the SEC’s top teams, with top-ranked Alabama visiting No. 4 LSU next Saturday night. 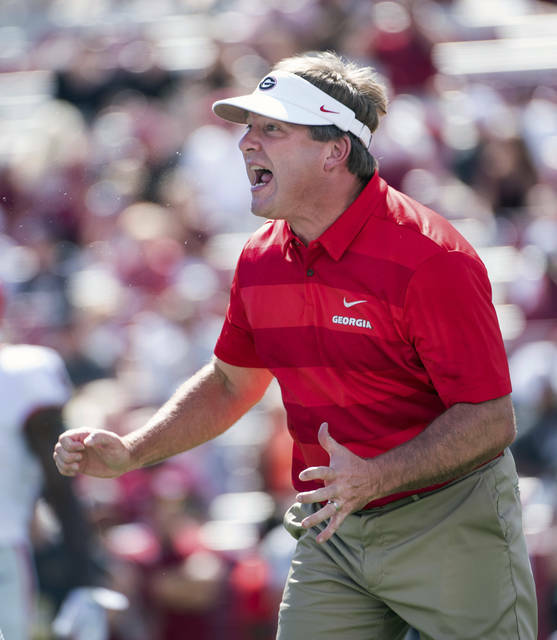 “It won’t be about what we say or how we say it,” third-year Georgia coach Kirby Smart said. “It’ll be about who plays well on the field and who controls the line of scrimmage that will be the key to this game. The Bulldogs got outworked at LSU two weeks ago , falling behind 16-0 in the first half and losing 36-16. The Tigers ran for 275 yards and took advantage of four turnovers. Georgia has spent the last two weeks stewing over their performance. Florida has come a long way since losing to Kentucky in early September. The Gators have won five in a row while making strides on both sides of the ball. They also haven’t forgotten last year’s 42-7 debacle in Jacksonville . They spent the week dealing with fallout from coach Jim McElwain’s alleged death threats and were told just before the game that McElwain likely would be gone after . Georgia has the best rushing attack in the conference, with Elijah Holyfield and D’Andre Swift combining to gain 850 yards and eight touchdowns. Florida counters with a three-man rotation that features Jordan Scarlett, Perine and freshman Dameon Pierce. Smart called the running game “critical” to the outcome. Mullen and Smart are Lake Oconee neighbors, with summer homes in the posh community about 75 miles southeast of Atlanta. “I see him over the summers, the years he’s been at Mississippi State, quite a bit,” Smart said. Although Florida has won 21 of the last 28 meetings in the series, the teams have split the last eight. The Bulldogs won three in row (2011-13), and the Gators followed with three straight. “A rivalry’s only a rivalry if both teams are winning,” Smart said.